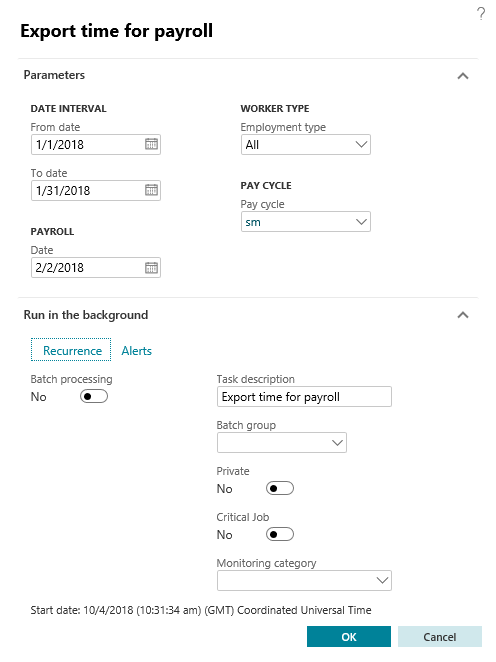 *This section details the process to export time for payroll and different options\filters available at the time of export. Once the pay codes are configured and information is validated, users can export the hours captured in the system using time export process. From date Enter the date from where hour records need to export. Payroll date Enter the payroll date for the above mentioned from and to dates. Worker type The options available are – All, Employee and Contractor. Select the option for which data need to be exported. Pay cycle Choose the pay cycle for which the time export is desired. The pay cycles available here is defined in the Human resource module.